Today I sit down to reflect over what to say when I open up the inaugural England Golf County Academy Conference tomorrow. The County Academies are in many ways the first step on the player pathway for young golfers wanting to progress. Many of those that in the future will be playing the professional tours will come nowhere near this step on the ladder though. In fact, when they are in their early years they may not even be thinking about golf. Somewhere along the way, if we want players that can play this game, we as golf better make sure that their paths cross ours. Traditionally that would be in a club environment to which the youngster is probably brought by parents or perhaps a friend. In this day and age though times are quite tough for sports. There seems to be a lot of other things that call for attention and more often than not those things are definitely more accessible than sport. Many times you do not need to leave the comfort of your own house. In fact, you could play a lot of sport without doing that, thanks to things like Wii and other gaming tools. So how can we compete with this? I think it is actually quite easy. And at the same time obviously incredibly difficult because we are likely to be looking at something like a massive oil tanker to try to turn around. It takes a lot of effort. and 4. the most difficult one of all – people who can help make all this the best thing since sliced bread and even more fun than the Wii at home. This week it is the tee off of the European Team Golf season. The European Nation’s Cup at Sotogrande has become a real test early in the year. England is out for the third consecutive win with a team of Laurie Canter, Tom Lewis, Jack Senior and Andrew Sullivan. Should be an interesting week! And as a sign of what Amateur golf is often like I cannot find a single bit about this tournament online. Will keep looking and update when I can! It is nothing new but it seems to have turned up earlier this year than ever before. The question of when to turn professional. For any player worth his salt this is a huge question and decision, many time made much bigger than what they need to be. Golf is, possibly together with boxing, a sport where the possibility of making money is made up on a decision and not by your level of performance. Obviously you need to perform to walk away with a check but unless you have made that conscious decision first, a great result won’t do anything for you. Once the decision is made it helps to have playing rights. Usually with the top amateurs in Europe that means we are talking about playing rights on the European and/or Challenge Tours. The way to get those is through the qualifying school. And if golf was anything like most other sports the alternatives would stop right there. It is difficult to imagine a way of qualifying for the Premier League other than winning the league below. However, golf is nothing like other sports. In addition to the qualifying system there is a bit of an open market out there. Starts on the Challenge Tour (and on the main tour) are available to the highest bidder. With sponsorship comes player invites, no matter if you are a company, a federation/governing body, or a management group. Of course this is a nice carrot to dangle in front of players in a way of ‘sign with us and we will offer you…’ in one respect I guess this is fine. The player gets the opportunities to play and the chance is there to perform well enough to get that card. The only problem is that the question of when the time is right goes completely out the window and there is a big chance that the time is right for one party only. The one making the offer. This offer is likely to be based upon the ‘brand’ of the player and the marketability the player carries and very little on skill levels and the assessment of whether he or she has got what it takes. In a different system, one where qualifying would be the one and only way this would regulate itself. Teams that are good enough generally do move into the Premier League. We could just do with helping ourselves a bit more in golf! Devoted readers will remember when I wrote about the experiences from the choir where two of my children sing (if you don’t, click here). The beuty of that choir and the Christmas concert that I of course went to see is that people of all ages and abilities come together. The less experienced have somebody to look up to and something to aspire towards. This also serves as a bit of a reality check as the risk of something that quite often happens in sport – somebody becoming a big fish in a small pond – is minimal. There is usually somebody there who is better, partly because he or she is older and more experienced, who will help the youngsters to understand that an important first step is probably to become the best in that bunch. As I now sit down and reflect over the first true sign of spring in English golf, the Sunningdale Foursomes, I realise that this exists also in golf. At least it does this week. the Sunningdale Foursomes are quite unique. Played around the beautiful Old Course at Sunningdale, for the first time in 1934, for amateurs, professionals, men and ladies it is just a great melting pot of different experiences coming together. Among the winners of previous Sunningdale Foursomes you can find Open Championship winners (Alf Padgham and Max Faulkner) as well as the current World number 3, Luke Donald. And even if not playing, you can bet your bottom dollar that a visit to Sunningdale this week will give you a good chance to spot ex Ryder Cup Captain and legend Sam Torrance hiding in the club house. It is of course this mix of grey hair with young enthusiasm, experience from the tour with junior champions and not the least men and women coming together that we should do so much more of. The silo type of working is a decease that is spreading across our society, not just in sport but in pretty much every walk of life and I am sure that it limits our development greatly. We have just got so much to learn from each other! 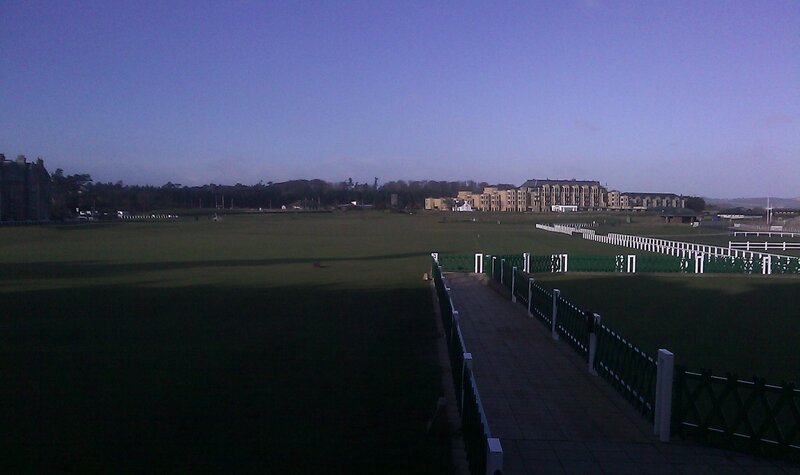 A bit of a stiff breeze today at St Andrews and as always when visiting an Open venue when the grand stands and tented village are not there I am amazed at what it looks like. There is something very special about the Old Course and the whole of St Andrews that makes it an even better place a morning in March than a Sunday in July when it is full of people. This atmosphere where golf is in the middle of town and the course an integral part of the landscape is quite unique. This time I am with the other Home Unions at the Golf Forum where things relevant to all golf bodies in the UK are discussed. Obvious items are declining membership figures, initiatives to capture the nomad golfer and the ambition to find better ways to support the improving player. There is one thing however that really captures my attention: Thank you notes. I remember when I first got involved in coaching. Pia Nilsson had just come off the tour in the US where many times players had kept their accommodation costs down by staying with members. Pia was big on thank you notes because she knew what they had meant to her and to the people she had been helped by. Another time where I have seen the importance of thank you letters was when I coached the European Palmer Cup team. Having been a college coach for many years, Gregg Grost, knows how to keep patrons and sponsors involved for future years and hence the list forwarded to players held important names and addresses. Many are those who love to be associated with appreciative youngsters who might make it all the way to the top. End even if they don’t – getting into the habit of saying thank you is not such a bad thing. Perhaps we can all try a little harder? Not much else you can say I think. Two englishmen in the final of the Spanish Amateur – again! Last year Matt Haines defeated Tommy Fleetwood and this year it was time for Laurie Canter to go head to head with Stiggy Hodgson. I am not sure what Laurie did, but he must have played some serious golf. 9 up through the first 18 and with 10 holes to go the two could already shake hands. Laurie had won, 11/10, and secured himself a place in the Spanish Open in May. For the full Spanish version click here. Laurie’s win was England’s fifth in four years starting with John Parry in 2007, Daniel Willet in 2008 and then Matt Haines in 2010 before Canter took over the trophy. And if this was not enough on a Monday morning – the new England clothing has started to arrive in Woodhall Spa! At the moment some of us wish we had a warehouse rather than an office but things should soon be out with players. Check out our model on the England Golf pages on Facebook! While I took a few days out to go on half term with my kids, some great stuff happened in the golfing world. Luke Donald became the Master of Match Play as he won the WGC in Tucson Arizona. I think Luke is quite a special kind. Having never been known as a long hitter he continues to show that what most of us have thought for some time, that unless you can hit it a country mile in today’s professional golf you have not go a chance, is not necessarily true. Instead Luke is a man of creativity, accuracy and brilliant short game skills. For the true golf nerd I actually think this is a much more interesting game than the bombers game that have tended to be prevailing in the last few years. And that is not to say that Luke is short of the tee as so often, I think that is a myth that has survived itself. For somebody in my position it is obviously interesting to try to think about how players like Luke make it to where he now is. As many probably know Luke took the US College route where he played golf at Northwestern at the same time as earning his degree. He had a very solid amateur career, topped with the Walker Cup and when he turned professional he was ready to compete at the bigger stage. Some of those that hope for a similar future this week compete in the Spanish Amateur. If you would like to try your Spanish skills you can follow all the action here. Played at El Prat this is proving a good test for the young apprentices as the first day only saw three players under par. The Spanish Amateur is one of those events that is quite important to win, for a number of reasons. It is early in the year and given the strong field it is always a confidence boost to come out on top and make a mark. For those that hope to follow in the foot steps of Luke Donald I think the most important factor though is the invitation o the Spanish Open later in the year. Most top amateurs today compete in a Worldwide, highly competitive schedule on really top notch golf courses. If they can combine that with some starts on the European or PGA Tour where they can benchmark themselves against the best, they have every chance to know where they stand before they decide to give golf for a living a real go.